The Tickled Trout is a beautifully warm, sunny and private 3-bedroom house. Perfect for your stay in Ulverstone. It is fully self-contained with a large kitchen and is located close to the town centre. The house has everything you could need for a comfortable and enjoyable stay. The house has a large floor mounted heating and cooling system to keep you warm during the cooler months and cool during the summer. There is also lots of off street parking and there is a very private, fully fenced back yard. Pets are welcome but please check with the owner first. They are charged at $20 per pet per night. This house can sleep up to 7 guests making it perfect for groups and families. The main bedroom has a queen bed; the second bedroom has a queen bed and the third bedroom has a double and a single bed. There is one bathroom and 2 toilets. The beds are fitted with electric blankets for the cooler seasons. A port-a-cot and highchair are also available for use free of charge. The beaches, parks, playgrounds and town centre are only minutes away. The house is fully self-contained with everything you and your family could need. The Tickled Trout is your 'home away from home' ! The property is licensed as a holiday home and is fully compliant with all safety regulations for your peace of mind. The property has smoke detectors, emergency lights, a fire extinguisher and fire blankets. Outside in the spacious, private, fully fenced backyard, there is plenty of room for the kids to run around. There is a Weber BBQ and outdoor setting. A washing machine is also available for your use. The Tickled Trout is only a short distance from our other property the popular property, Seaview House. The Tickled Trout is situated in a very peaceful and quiet location with no through traffic. The house is located only a short walk into the town centre where you can go shopping or enjoy a meal or a drink at one of Ulverstone's many bars, cafes and restaurants. Also, a 5 minute walk away are Ulverstone's pristine yet safe swimming beaches, parklands, tennis courts and Ulverstone's new Sports Complex and Basketball Centre. One of Tasmania's best golf courses (Ulverstone Golf Course) is just a short drive away. The town of Ulverstone is located close to the Spirit of Tasmania terminal (20 mins), Burnie (20 mins), Devonport (20 mins) and Launceston airports (1hr), Cradle Mountain (1hr), Tarkine rainforests (1hr) and Stanley (1hr). The Tickled Trout is an ideal base for exploring the beautiful North-West Coast of Tasmania. Pets may be allowed at the Tickled Trout. Please contact the owner prior to booking. Pets are $20 per night per dog and a security bond may be required. The Tickled Trout is a lovely spacious and sunny house. The house is very private and has loads of off-street parking. The house is also pet-friendly with a secure backyard. 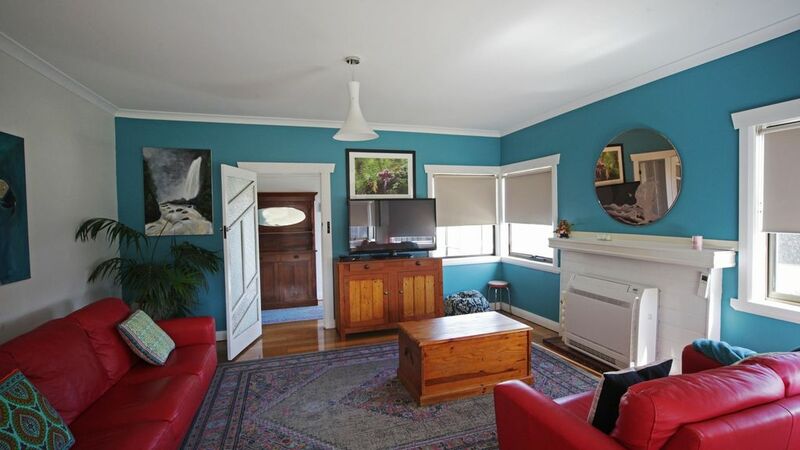 A 'home away from home' that is only a short walk into town, the river and the beaches of Ulverstone. Lovely property, perfect for dogs. We were able to go for long walks with the dogs, everything was nearby and the house was perfect! Great house and location. Very clean. Owners very accommodating with requests. Thanks for your comments Wayne and I really appreciate you and your family leaving the house in such lovely condition. Hope to have you stay again sometime. Great place, plenty of room, very friendly. Would have preferred if fenced though. We thoroughly enjoyed our stay . We found it handy to town , easy walking distance. It had every thing we needed. Our family that joined us later in the week also really liked it.